From our friends at Exponential Audio you can enter to win your very own copy of PhoenixVerb, just for liking Exponential Audio on Facebook. This is the reverb that Audio Media called “the best that I have ever heard”. Our very own Mike Thornton said “Amazing reverb, stunning sound. I just love it!”. 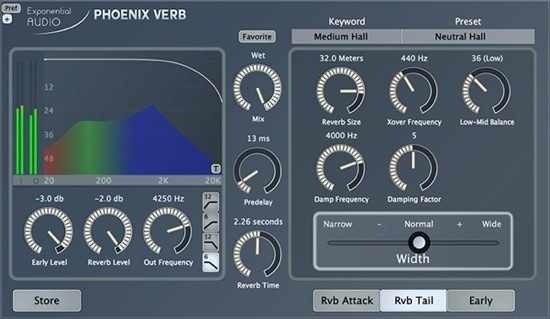 Watch Mike’s show & tell video of the earlier versions of both the Phoeniixverb and R2 Reverb plug-ins and find out why they are his ‘go to’ reverb plug-ins. Music Radar called it “possibly the cleanest reverb we’ve ever heard”. You’ve already heard PhoenixVerb on many mixes, from metal to classical to television to major motion pictures. Enter any time in the month of May, simply by clicking right here. There’s only a single winner, so why not you? The drawing will be held on June 2. You’ll be notified if you’re the winner. We’ll even put you on our website! Haven’t tried PhoenixVerb yet? Then head on over to Exponential Audio and go to the Product page. You’ll find a special demo code that you can download to your iLok2. While you’re there, take a look at some of the places where Exponential Audio plugins have turned up. Maybe you’ll be next if you enter the competition.